Ask anybody who has held so much as a bud vase from Heath Ceramics about the pottery’s charms, and you’re likely to encounter the kind of adoration reserved for treasured family heirlooms. So great is the ubiquitous enthusiasm for Heath that one is left wondering if something more than pigment is baked into its signature glazes. Its popularity may stem from its timeless, unfussy quality—–a Heath piece looks equally at home alongside decor of any epoch. But more likely it is due to the fact that in an era dominated by the rise of machines, this small company has honed a homespun, handcrafted approach to stoneware that’s tangible in each tile, serving bowl, and pitcher that comes out of its Sausalito, California, kilns. Heath’s Sausalito factory was purpose-built for Edith Heath. The original kilns and equipment are still being used at the behest of owners Cathy Bailey and Robin Petravic. 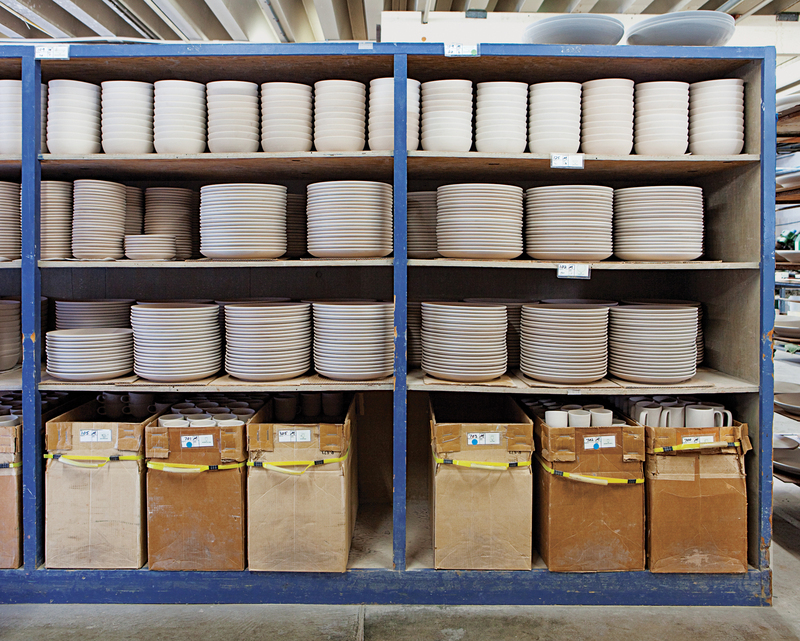 Stacks of unglazed dishware line the shelves at the Heath factory in Sausalito. A short ferry ride across the Bay, the San Francisco Ferry Building is the latest location for Heath to display its colorful wares. 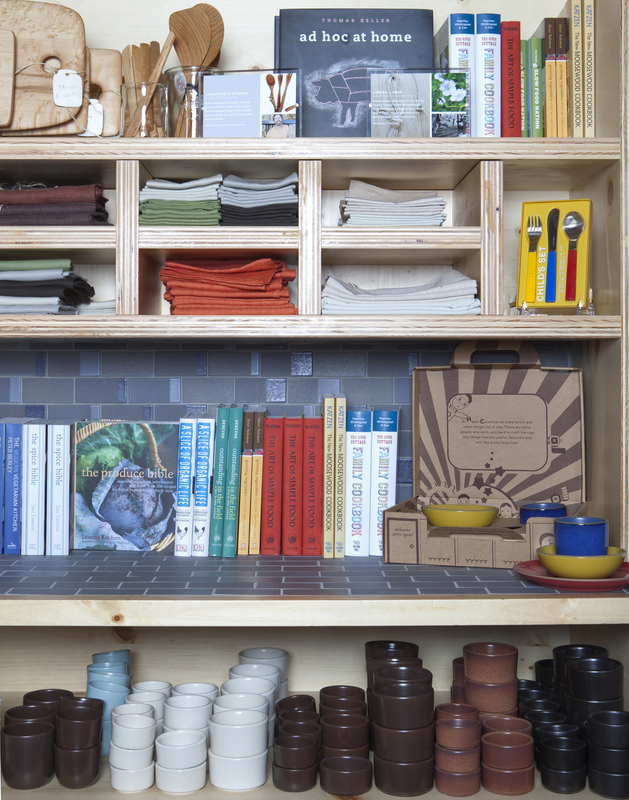 Tableware shares space with a curated collection of books, tea towels, and treasures for the home. The Ferry Building shop displays seasonal goods as well as items from some of Heath’s most popular collections. The top shelf here features serve bowls, platters, modern cups, bud vases, and a pitcher from this year’s Summer line in aqua/zest and ocean pacific. Heath worked with chef Alice Waters and designer Christina Kim to create the Chez Panisse line, named after the famed Berkeley restaurant, which is seen here on the second shelf: side bowls, mugs, and café bowls in Jicama, Cardoon, and Forrest. The backsplash is Heath dual glaze tile. 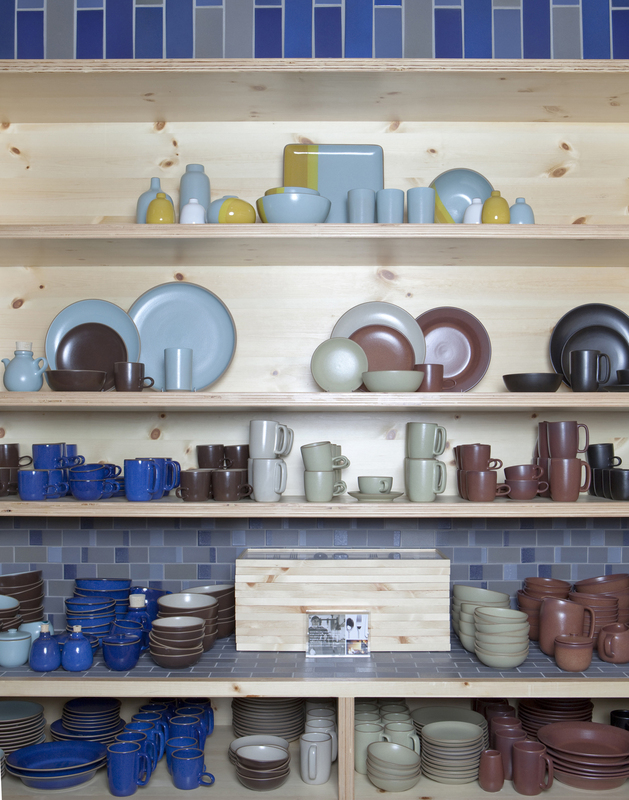 A tableau of tableware at the Ferry Building location shows the range of glaze options and styles of stoneware available. This year’s summer collection is featured on the top shelf, above platters, mugs, bowls, and a small teapot from the traditional Coupe line on the second shelf from the top. Dessert bowls, salt and pepper shakers, pitchers, pasta bowls and more round out the display. A close-up of cream & sugar in aqua and moonstone, salt & pepper in moonstone, and bowls in matte brown and burch. A multi-hued sea of serve bowls in the San Francisco Ferry Building shop. The Sausalito factory store has shelves full of tile samples, so visitors can check out the wide variety of glazing options available. Racks of bisque dinnerware in the Sausalito factory before they become the bright and beautiful pieces that line the shop shelves. Like an archaeological site, remains of stoneware can be found in the recycled clay from the Sausalito factory. A cart full of recycled clay. What’s at the heart of Heath’s appeal? Robin Petravic: People build a relationship with these products that have a simple purpose. 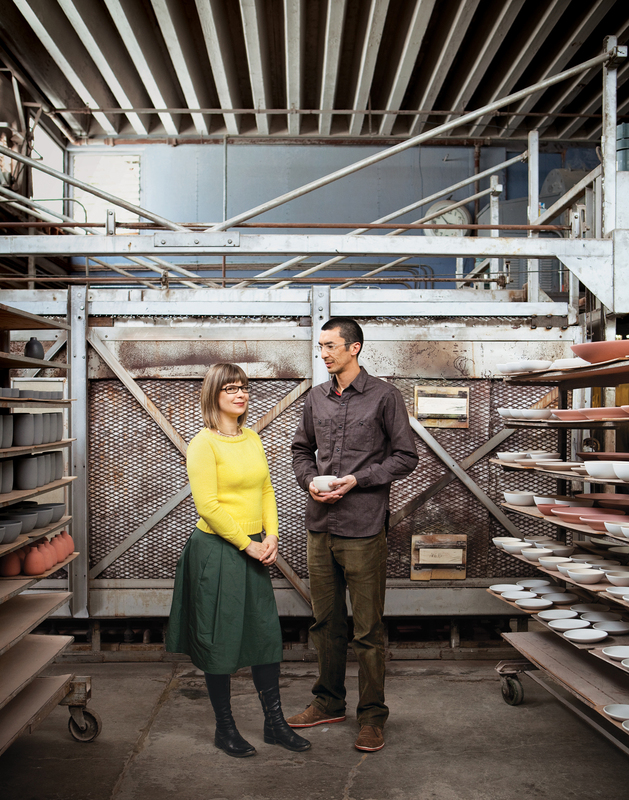 Heath is like a farmers’ market for ceramics on the small scale of an artisan bakery—–it’s as if pieces come out of the kiln and go right into the hands of the customer. The whole process is very transparent. Why is that transparency important to convey? RP: Ultimately it’s about design intent. There’s a lot of care and skill that goes into these pieces. Cathy Bailey: Edith Heath wanted her products to look like there was craftsmanship involved. Every piece is not identical; the basic gesture and shape is the same, but very slight trim or glaze changes show up because there are hands making everything. RP: There are few places where you have this amazing studio and factory a couple hundred yards from the bay. Our workers can sit by the window—–feel the sunlight, hear when the seagulls fly by—–while they’re making pottery. It’s great. Where do you find the items you aren’t making yourselves? CB: I’m a searcher, always hunting. Sometimes it’s just following a lead online; I met Andy [Cruz, owner and founder of type foundry House Industries] because he blogged about his trip to the factory, and now we’re doing a project together. Sounds like a perfect match. What can we expect from that collaboration? CB: We’re working on modular tile numbers in a new House typeface, which will be available in fall of this year. How does a piece go from conception to production? RP: And she understands technique, down to the mold-making. CB: We have one product designer, Christina Zamora, who is amazing. She really makes it all happen. I hired her as an intern, so she’s been here almost the whole time that we have, and she really gets that Heath items are really about materials. How do you update and modernize a classic collection? RP: We look at what was interesting about previous methods and see if we can push that somehow. Every year it gets better; we learn a little more each time we do it. CB: Every summer and every winter we introduce new things, but they don’t stay with us forever. So we’ll experiment—–play around with color, change the shape, or add a new item—–and then we move on. CB: Our annual sale and open studios are both huge events now. We open up the whole factory, and the guys in production work on the weekends making stuff. It’s fun, but a complete madhouse. RP: We’re searching for really good-quality—–and hopefully American-made—–stemware, which is hard to find. If we can’t find it, we’d love to try to figure out how to make it ourselves. It’s a long-term goal.